Nikki Briar has been making lots of buzz in the country music scene. As a native from NJ who performs and records in Nashville and tours nationally, Briar has shown the music industry that country music really does have roots everywhere. Releasing her 5th radio single and EP, Briar has had numerous accomplishments over the last 7 years of her music career and looks forward to many more to come. From performing at TASTE OF COUNTRY with Tim McGraw and Billy Currington to sharing the stage with country music superstar Lorrie Morgan, Briar is truly driven by her passion for music, being on stage and her devoted fans. When recently asked during an interview what was one of her favorite highlights from the previous year, she talked about her enjoyment of being on the Fox 5 television show, NY STAR OF THE DAY and performing with the talented Bernie Williams and flirting with the show host, Ernie Anastos. While performing over 200 shows a year, Briar contributes her free time to doing charity work and benefit concerts for military organizations and animal welfare groups. As an army wife, she enjoys performing the national anthem for various occasions, from sporting events at arenas to military ceremonies. 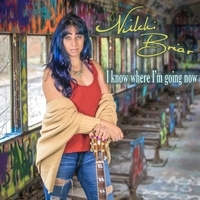 As Nikki releases her 5th single and EP entitled I KNOW WHERE I'M GOING NOW, you can follow her on her 2018 radio and performance tour on her website. She enjoys chatting with fans and connecting on social media so follow her and stay up to date on her performances and new music. Great catchy song and amazing music video!